We feature an eclectic selection of antiques and collectibles covering a wide range of interests. Visit our shop each day to see our new listings. This condiment dish was part of the Blue Gold Rope IFC pattern (DAL-7) used for meal service aboard Delta Airlines International Business Class during the time period of 1993 to 1999. Manufactured by ABCO International, it features an elegant cobalt blue perimeter decoration with burnished gold rope design, inset 3/16" from the edge of the plate. This is a more basic version of the pattern that was utilized on Delta's International Business Class and First Class china. The Business Class and First Class versions of this pattern both share the inclusion of the blue gold rope design. The First Class pattern has three additional bands of gold, and the decoration is on-edge, rather than inset. Advertisements in our research sources place the vintage of this pattern between the years 1993 and 1999, during the beginnings of Delta's dominance as an international carrier. 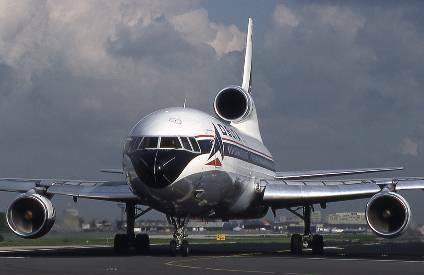 Lockheed L-1011 used for Delta's international flights, numbering as high as 56 in service at one time. Delta Airlines purchased most of Pan Am's European routes after Pan Am declared bankruptcy in 1991, acquiring their East Coast and European routes including intra-European routes from the Frankfurt hub. In the 1990s, Delta had the largest transatlantic route network among U.S. airlines. Delta remains the largest U.S. transatlantic carrier, in terms of passengers carried and number of flights operated.